...Because I'm not wearing green! Tee hee! I don't actually own much green....just a sweater. Which I don't really feel like wearing. It's just not really my color, I guess. 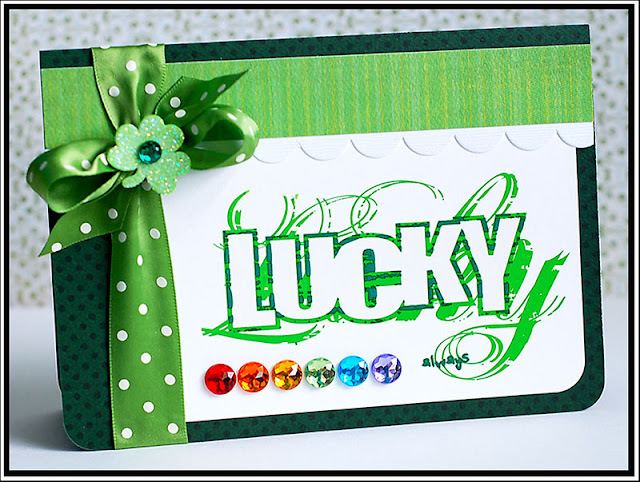 But, I do have some fabulous green cards to share with you today! 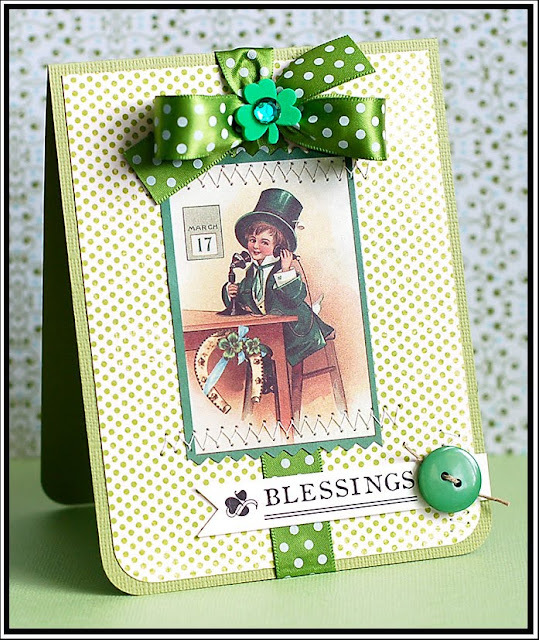 I decided I needed to get a couple St. Patty's Day cards done to share with you today! The first one uses Kazan's Sketch 48 from 2 Sketches 4 U this week. And I used the sewing machine again...two days in a row! Instructions: Fold green cardstock in half to make card base, and round the bottom corners. Round the bottom corners of a green dot paper block, and adhere to the front. Tie ribbon around the middle, and accent the bow with a foam shamrock and green jewel. Zig zig stitch the vintage image to the front. Add the rub-on to a strip of cream cardstock, and cut a banner end to it. Stitch to the front of the card, and accent with a button & twine. And this one uses the bonus sketch at 2 Sketches 4 U this week by Sarah Martina. Funny....I think I flipped both of the sketches this week to work with how I wanted them. I was going through my entire stash the other week...pulling out things that I have not used in a VERY long time...and I found this rub-on. It is from a company that I don't think is in business any longer, and I would imagine I have had it in my stash for at least 3 years. If not longer. Figured it was time to try it out...tee hee! Instructions: Fold green dotted paper in half to make card base, and round the bottom corners. Round the bottom corners of a white cardstock block, and adhere to the right side of the card. Add a white scallop to a strip of green paper and adhere to the top. Tie ribbon around the left side of the card. Glitter a foam shamrock, and adhere to the bow. Top the shamrock with a green jewel. Apply the rub-on to the white cardstock block, and accent the bottom with rainbow colored jewels. Alex Lambert was on the Ellen show today! He is such a cutie...very funny and charming. Very shy too...you can just tell. He sang a song we didn't hear on idol, and it was awesome! I just know a label is going to pick him up, and I can't wait to hear an album by him. What a good kid! Here is his portion of the show. Wow Lea... these are great!! Amazing cards, but I really like the second one, and the reference to rainbows. You and rainbows = amazing work. Stunning green cards today! That's such a fun rub-on, its so great to find treasures in your stash! These are great! I especially love the first card. Happy St. Patrick's Day to you Lea! Perfect cards to celebrate the day! I love the lucky always-the colored rub-on is really cool! I like your use of the rainbow rhinestones. Fun fun fun! Nice! Love that vintage image on the first one, what a great look! These are sweet, love the vintage one! They also fit the Cupcake Craft challenge - green! Beautiful cards, green is not my color too !!! Cute, cute, cute, Lea!!! Great job with your sewing machine. It's addictive if you ask me! ;o) Gosh, I love that polka dot ribbon!!! So glad I'm not the only one lacking green. Actually my closet really lacks basically anything with color! I love both cards, and it's too bad Lil' Davis isn't still in business I liked several of their products! I love your cards and thoughts. Where did you get all your artistic talent my little girl! love your take on Kazan's sketch! great st. paddy's day colours! Such a lovely cards! Especialy the 'lucky' one because green is my color! Thanks for the comment on my card! I lve the card you made for the challenge! love your cards! love the vintage image on the first! These are just gorgeous Lea! Beautiful image and stitching on the first, and you know how I love some rainbow bling! how fun are these! adorable!